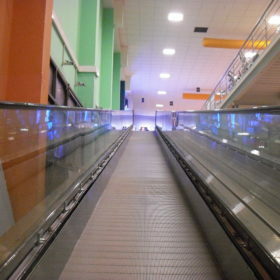 Discover structure and technical features of F inclined moving walkways, ideal for delivering vital access over different floors for customers and their shopping trolleys in private facilities, such as shopping centres. F inclined moving walkways offers the most efficient solutions to transport people and shopping trolleys from one floor level to another. Looking for a moving walkway for your facility? Discover all available types and ontact us for a personalised quotation.